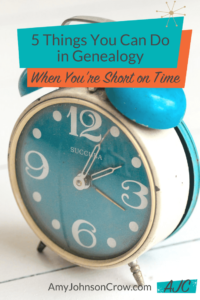 “What family history tasks could a busy person do if they have irregular 15-minute time chunks?” Devon Noel Lee of A Patient Genealogist recently asked me that great question. 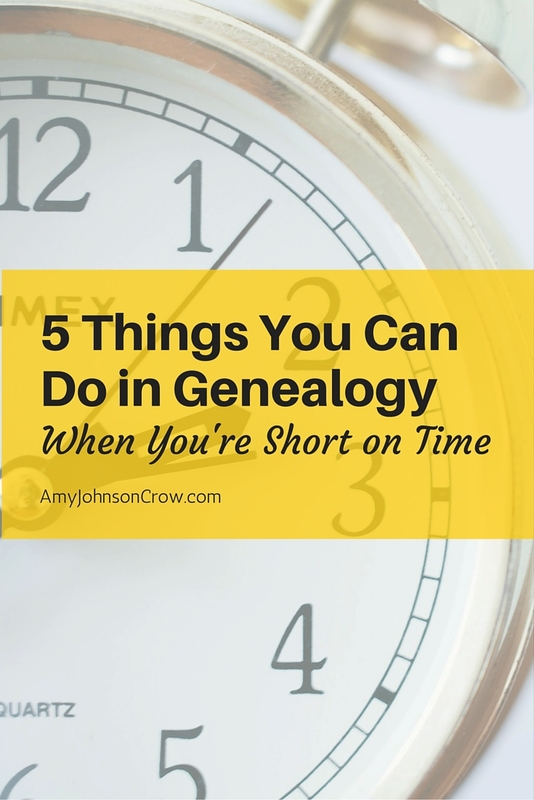 As much as all of us would love to spend uninterrupted days on end exploring our family history, reality is much closer to “I have 15 minutes before my next appointment. What can I do now?” Here are 5 things you can do to be productive. 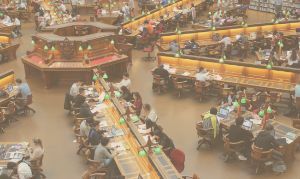 Transcribing a document is a great way to get more out of your research. You’ll pick up clues that go unnoticed when you’re just scanning “for the good stuff.” Even if you don’t get all the way through it in 15 minutes or you get stuck on a few words, it’s often enough time for a good first pass through. This seems counter-productive, but it actually helps in the long run. 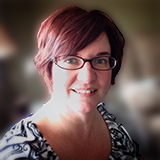 Having a good to-do list –whether you keep in on paper, in your genealogy software, a spreadsheet, or Evernote — helps keep our thoughts and our efforts organized. 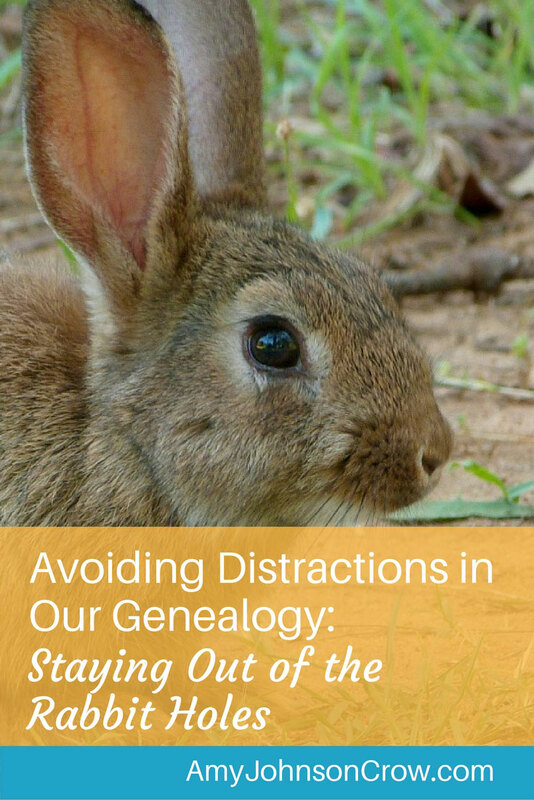 Brainstorm about a genealogy problem you have and the resources you want to explore. Once you have a list, you can use that as starting point when you have a spare 15 minutes to work in. (“Hmmm, I need to explore land records for great-great-grandpa.” Then you can spend your 15 minutes looking on FamilySearch to see if they are online or on microfilm, and preparing for when you have a longer stretch of time to actually use the records.) It’s all in the preparation. ​If you want even more ideas, check out ﻿these 5 more things you can do. 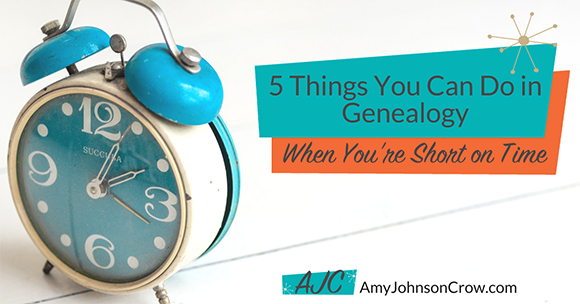 What genealogy-related things do you do when you have only 15 minutes to work on it? Leave a comment below — I’d love to hear your suggestions!